Author of the epic fantasy series, The Gift-Knight Trilogy, Dylan Madeley brings to you the third and last in the series, The Masked Queen’s Lament. A brilliant novel that blends medieval times with on-going issues of the world we live in today. A fantastical and medieval plotline combining elements of eccentricity, adventure, treason, power, knighthood and intrigue. 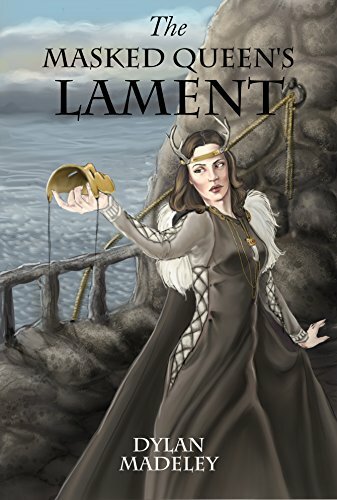 The Masked Queen’s Lament continues Madeley’s narrative from books 1 and 2 (The Gift-Knight’s Quest and The Crown Princess’ Voyage) to conclude the dramatic twists and revelations conveyed throughout all three books. The story is set in the medieval era where “Alathea enjoy[s] the feeling of all the thunder-men staring at her, not daring to blink, ready for her signal.” As a ruler of the land, the protagonist attempts to recreate a world in how she perceives it to be. However, all is not as simple as it seems. Alathea must reign in all of her troops in order to combat the wicked witch “Crown Princess Chandra Kenderley”. A real medieval plot line that allows the reader to envision concepts of reigning, power, control, and misjudgment. Dylan Madeley does a fantastic job at writing fluently with regards to his characters. The characters are well described, and I was able to clearly envision what they would look and act like. The author clearly knows how to build his characters. Despite being the third book in the trilogy, Madeley still continues to keep the reader’s attention with these characters, reinforcing how their presence in the book is key to its success. What I loved about this book is how the story follows the life of power and reigns. Think about this book like a Game of Thrones episode – packed full of terror, excitement, uncertainty, and conflict. As the story unfolds, the reader is made aware that the end result is going to be via battle, and who wins that battle is very much left in suspense until the very end. I won’t provide any spoilers for those of you longing to read this book, but what I can say is that the ending does not disappoint! The only downside to the book is the flow. I found it slow at times, particularly in the first few chapters. However, the pace does pick up as the reader is subject to more action between the characters, and this is where it got more interesting for me. What makes for good reading is uncertainty, eccentricity, and uniqueness, and I believe the author of The Masked Queen’s Lament does this outstandingly. The grammar and punctuation is strong, and the narrative is creative and unique. An emotive, fantastic, epic medieval storyline that is well-written and well-thought out by the author. Dylan Madeley has proven to be a great author, and this book is a great way to end The Gift-Knight Trilogy. Posted on July 16, 2018, in Book Reviews, Three Stars and tagged action, adventure, alibris, author, author life, authors, barnes and noble, battle, book, book club, book geek, book lover, bookaholic, bookbaby, bookblogger, bookbub, bookhaul, bookhub, bookish, bookreads, books of instagram, booksbooksbooks, bookshelf, bookstagram, bookstagramer, bookwitty, bookworks, bookworm, dylan madeley, ebook, epic, epic fantasy, fantasy, fiction, game of thrones, goodreads, ilovebooks, indiebooks, kindle, knight, kobo, literature, medieval, nook, novel, prince, princess, publishing, quest, read, reader, reading, reign, royalty, shelfari, smashwords, soldier, story, the masked queens lament, war, writer, writer community, writing. Bookmark the permalink. Leave a comment.